At Ayre Counseling, we are advocates for your children. 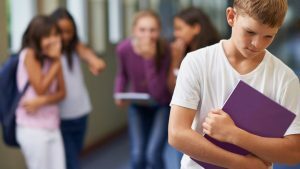 Bullying is a chronic issue that impacts children of all ages and can cause significant emotional and physical distress. We utilize a compassionate approach for your child that will help lessen the stress, fear, anxiety that is associated with bullying. Early intervention can significantly reduce the long-term impact of bullying on your child. Helping your child through the difficult school years can help your child improve self-esteem, self-awareness and improve their quality of life. Our approach will help empower and equip your child to take back control of their lives. We can help your child understand their feelings and move forward with their lives. Health complaints including increased absences from school or extra-curricular activities. Repetition: Behaviors happen more than once or have the potential to happen more than once. At Ayre Counseling, our experienced staff can help you and your child put a stop to all forms of bullying. Give us a call to learn how we can help, or just fill out the contact form and press Send.